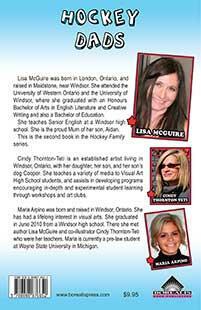 About the Book Lisa McGuire was born in London, Ontario, and raised in Maidstone, near Windsor. She attended the University of Western Ontario and the University of Windsor, where she graduated with an Honours Bachelor of Arts in English Literature and Creative Writing and also a Bachelor of Education. She teaches Senior English at a Windsor high school. She is the proud Mum of her son, Aidan. This is the fourth book in the Hockey Family series. Lisa McGuire was born in London, Ontario, and raised in Maidstone, near Windsor. She attended the University of Western Ontario and the University of Windsor, where she graduated with an Honours Bachelor of Arts in English Literature and Creative Writing and also a Bachelor of Education. She teaches Senior English at a Windsor high school. She is the proud Mum of her son, Aiden. Cindy Thornton-Teti is an established artist living in Windsor, Ontario, with her daughter, her son, and her son´s dog Cooper. She teaches a variety of media to Visual Art High School students, and assists in developing programs encouraging in-depth and experimental student learning through workshops and art clubs. Maria Arpino was born and raised in Windsor, Ontario. She has had a lifelong interest in visual arts. She graduated in June 2010 from a Windsor high school. There she met author Lisa McGuire and co-illustrator Cindy Thornton-Teti who were her teachers. Maria is currently a pre-law student at Wayne State University in Michigan.